It all started with one truck, an old 1974 International cabover. 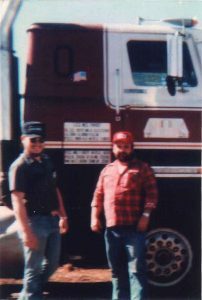 In 1981, Charlie Billman (father) and Jerome C. Billman (son) each bought half on a 1974 International. After 9 months, Jerome bought his father’s half of the truck. In the late 1980s Jerome bought a few more units to grow his fleet. In 1995 his dream became reality. He broke out and Billman Trucking Inc. emerged. Currently, the company stands strong with 30-35 trucks and 60-70 trailers. Jerome is the most honest person I ever worked for. You don’t have to worry about getting cheated on pay, and the equipment is in good condition. They run you really good. Everyone here is more understanding. The stuff we haul is really easy, one pickup and drop. If you want a good living, good equipment, and good easy people to work with, work for the Billman team.